Above & Beyond Presents OceanLab - Sirens Of The Sea. Vinyl LP, CD. Anjuna Music Store. Ibiza - the birthplace of modern dance music. 20 years on and the island remains an important catalyst for today's hottest dance talents. 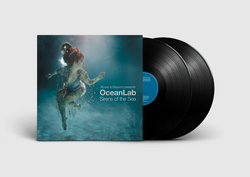 This year, OceanLab, the project featuring Above & Beyond and singer/songwriter Justine Suissa spent several weeks holed up in a villa there finishing their debut album, "Sirens Of The Sea". Seeped in Balearic brilliance, "Sirens Of The Sea" is a mix of blissed out epics and dancefloor cuts. An album of depth, variety and serene beauty, showcasing a level of songwriting and production rarely witnessed within electronic music, and already drawing comparisons with bands such as Zero 7 and Everything But The Girl.